Arthur Franklin Moore, M.D., was born 9 February 1925 in Texarkana, Texas to John E. Moore and Nina Raley Moore. He had two brothers and two sisters. He attended Texarkana Texas High School. In his late ‘teens, he became a corpsman in the Army in 1943. There he met his future wife, Lt. Theresa Hardesty, a nurse. He received a B.S. from the University of Arkansas in 1949 and a M.D. from the University of Arkansas for Medical Sciences in 1954. Dr. Moore was an intern at Crawford Long Hospital, Atlanta, Georgia 1954 – 55 and a resident in internal medicine at UAMS until 1959. In 1959 he joined ]oe B. Hall, M.D., in establishing the Fayetteville Diagnostic Clinic as the first two internal medicine specialists in the region. Dr. Moore was a pioneer in organizing assistance for the handicapped. In 1963 he helped organize the Washington County Chapter of the Arthritis Foundation and the first physiotherapy pool for arthritis in Arkansas in 1964. 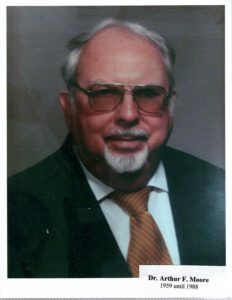 From 1964 he was the regional medical consultant for the Arkansas Department of Rehabilitation for more than 20 years. In 1965 he was a co-founder for Abilities Unlimited serving disabled patients. He pushed for the establishment of a Physiotherapy Department at Fayetteville City Hospital and a Renal Dialysis Unit at Washington Regional Medical Center. opportunities for area physicians and served as its medical director. For a number of years, he taught the medical aspects of rehabilitation to graduate students in Rehabilitation at the University of Arkansas. Hospital, Siloam Springs Memorial Hospital, Rogers Memorial Hospital, and Bates Memorial Hospital, Bentonville. Professional society membership included the American College of Physicians, American College of Chest Physicians, American Society of Internal Medicine, the Arkansas Medical Society, and the American Medical Association. Dr. Moore and Theresa had two sons and three daughters. One of his passions was photography. His devotion to patients for almost 30 years and efforts to improve delivery of health care resulted in the Eagle Award from the Washington Regional Medical Center Foundation in 1996.